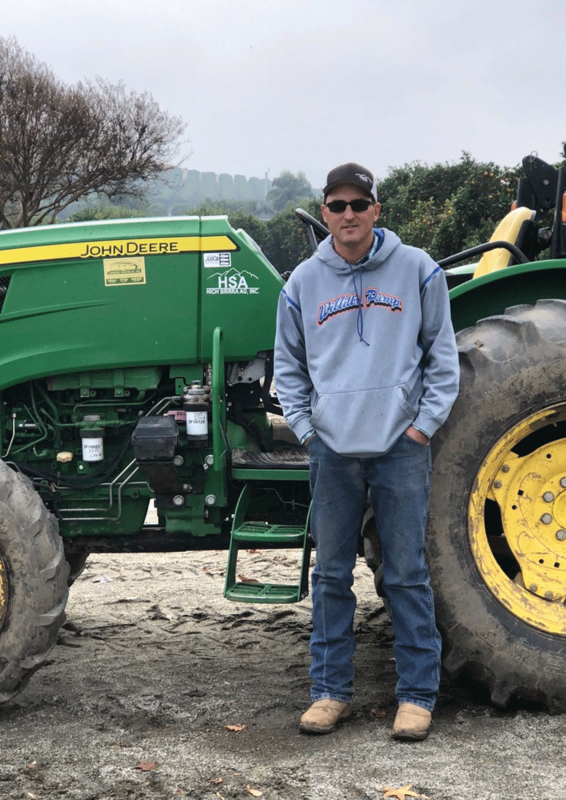 EXETER – It’s been 10 years since a Tulare County farmer last won the California Farm Bureau (CFB) Young Farmers and Ranchers Achievement Award, and a whole lot longer since someone from California earned the title from the American Farm Bureau. Last week Zack Stuller of Exeter, won the state title. He’s on his way to New Orleans next month, competing to bring home the national one. Stuller is not from a farming family. He grew up in a small community outside of Marysville, where his father is the fire a retired Cal Fire chief and his mother works as a civil engineer. But, Stuller always knew he wanted to be involved in ag. Although he did work with the forest service during the summers of his high school years, after graduation he attended Cal Poly, studying agriculture. It was there he met his wife, Samantha. He then took a job in Huron, working for a 30,000-acre row crop farm, which also grew some almonds and citrus. His first job there was as a farm equipment mechanic. Samantha, meanwhile took a teaching position as an ag instructor in Visalia. About six years later, Stuller was offered a position with Sun Pacific, where he eventually oversaw the company’s growing operations from Porterville to north of Sacramento. But, in 2008, he also started his own custom tractor service, working nights. “The progression of which got me to this,” he said. The Stullers moved to Exeter in 2012. And, by 2017, Zack Stuller had to make a decision – either go into his own business full time, or quit and continue his work with Sun Pacific. He chose the latter, where he, at the time, had five employees. Now, 18 months later, he has 16. The original primary focus of his business, High Sierra Ag, Inc., was the redevelopment of orchards. They would tear out the old, and replant the new. But, as secondary work, he added farm management, which has consistently been growing. He is seeing the two swapping as the primary and secondary facets of the business, he said, with a higher need for farm management. That is something he would like to focus on more, anyway. Stuller has served on the Tulare County Farm Bureau (TCFB) board since 2013. TCFB Executive Director Tricia Stever-Blattler had been hounding him to apply for the CFB Young Farmers and Ranchers Achievement Award for some time, he said. Being you must be under 36 to apply for the award, and Stuller is 35, this year was “now or never,” he said Stever-Blattler told him. “Zack is a very strong and talented young entrepreneur,” Stever-Blattler told the Sun-Gazette. “He was active in our Young Farmer and Rancher Committee for several years, and once he went out on his own, starting a business, investing capital, and making a name for himself, I knew he would be a strong candidate for the production achievement award. Applying for the award was no easy feat either, there is a lot of information one needs to share. But, even more so for the national award which has a 39-page application. But, being a first generation farmer also carries a lot of weight, Stever-Blattler said. And, she hopes that will help his chances. The Stullers have three children, 6-year-old Henry, 3-year-old Eleanor, and 3-month-old William. They own a small farm outside of Exeter. His employees are like a second family, Stuller said, and are vital to the business. His first hired employee remains with the company today. “You can’t do it on your own,” he said. Today, Stuller’s favorite thing to do is drive his tractor, he said. The CFB is paying for Zack and Samantha Stuller to attend the national convention in New Orleans in January. The last TCFB member to win the CFB Young Farmers and Ranchers Achievement Award was Josh Pitigliano of Tipton, 10 years ago. The CFB Excellence in Ag Award, which is given to someone who doesn’t farm but is employed in ag, has been awarded to two TCFB members in the past 10 years, Jennifer Wessel, DVM of Tipton and Matt Watkins of Exeter.